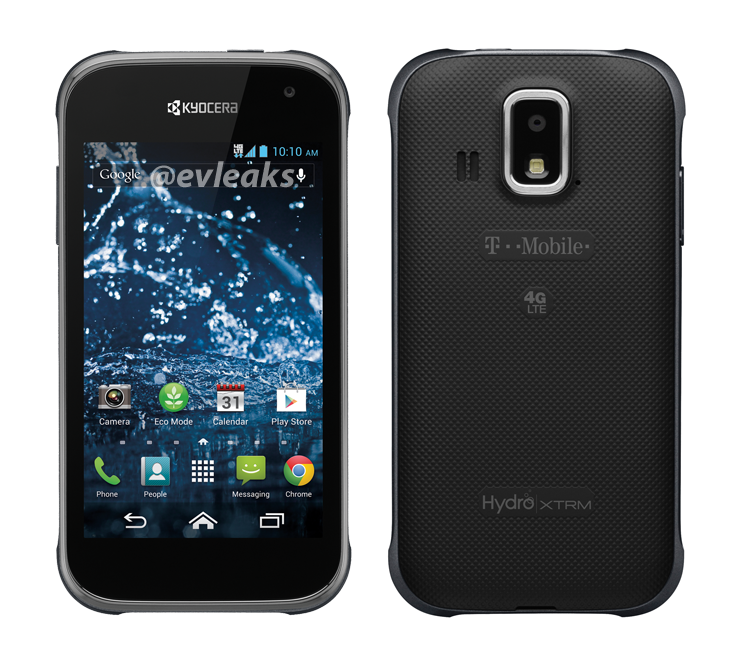 Say hello to the Kyocera Hydro XTRM (extreme), a newly discovered T-Mobile branded device that outed on Twitter by our friend @evleaks. A quick Google search yields the Hydro XTRM as a smartphone for the rugged lifestyle, thanks to its waterproof and dust-proof build. All in all, the Hydro XTRM looks to be a fairly decent mid-range device and when you add Jelly Bean/LTE connectivity, it may be a phone T-Mobile can use to capitalize on the B2B market. Rugged devices have always lingered on the edge, but there’s a definite audience of folks who can use a device that will hold to up while working in the toughest of conditions. Performance isn’t likely to be the selling point of a device like this, instead, it’s outdoor capabilities paired with durability will be the biggest reasons to consider this Kyocera smartphone. No word on price or release date. More info at Kyocera’s website. The 4G LTE logo on the status bar looks cool! What size is the bloody screen!? Good lord..Who posts an article about a phone and doesn’t inform it’s readers one of the most important aspects about the device? It’s called a leak. Sometimes you don’t get any additional info other than the picture itself. There is a business market out there for ruggedized phones, such as the Samsung Galaxy S4 Active, and the Kyocera Torque, maybe even bundled with a Push-To-Talk app. It appeals to people that want a phone that is Otterbox tough, right out of the box, and serves well to siphon some of the remains of Sprint’s failed Nextel venture over to T-Mobile. It’s not for everybody mind you, but there is a significant market segment that demands such a product. Now if they would just bundle it with a 4000mah battery, and add a Quad-Core processor. I’ll take at least 10 if they decide to offer it. Ah yes, Another clueless Troll. caught in the well know Sammy GS2 boot loop. Kyocera making a gsm phone? It’s been so long. Still going to be a pos like all Kyocera / Sanyo products. would get the rugged Casio big V sells. Good to finally see a midrage LTE phone! Hopefully there are more to come! They also have the LG F3. Which is priced very well at Metro. Not so well at T-Mobile. Hopefully it has a 4.7 inch screen and a decent battery.